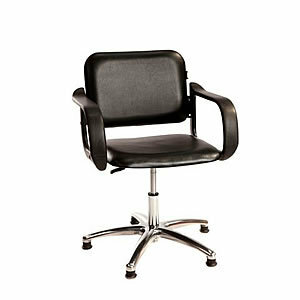 Crewe Orlando Jamaica gas lift styling chair in black upholstery with chrome base, chrome gas lift, black nylon arms, Jamaica backwash chair and 2 and 3 seater dryer banks also available. (please use the drop down box to choose). Dimensions height 41-54cm, width 56cm, depth 53.5cm.